With 3D Systems' affordable industrial FabPro™ 1000 3D printer and our FabPro Elastic BLK elastomeric material. 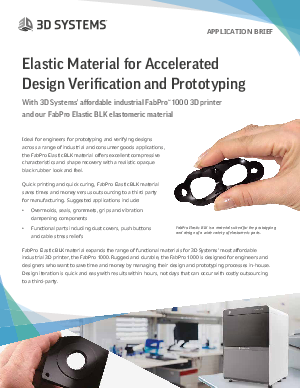 Ideal for engineers for prototyping and verifying designs across a range of industrial and consumer goods applications, the FabPro Elastic BLK material offers excellent compressive characteristics and shape recovery with a realistic opaque black rubber look and feel. FabPro Elastic BLK material expands the range of functional materials for 3D Systems' most affordable industrial 3D printer, the FabPro 1000. Rugged and durable, the FabPro 1000 is designed for engineers and designers who want to save time and money by managing their design and prototyping processes in-house. Design iteration is quick and easy with results within hours, not days that can occur with costly outsourcing to a third-party.